The story surrounding college football is usually the game that is played on the turf – not the turf itself. 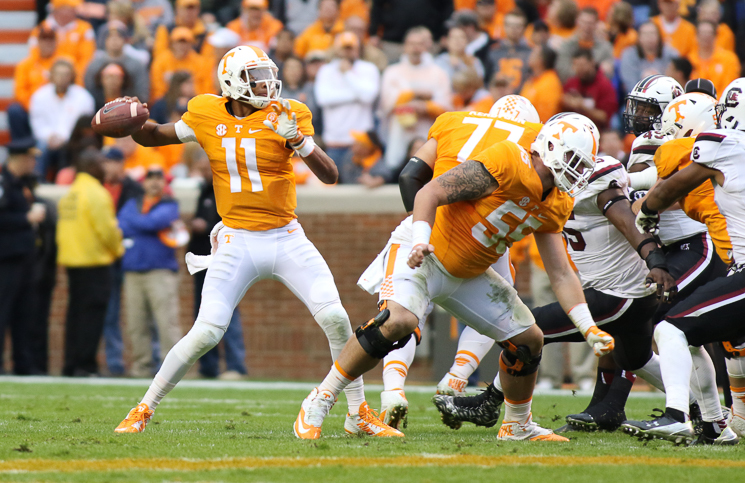 But that changed a bit on Saturday when several players from both Tennessee and South Carolina slipped at various time during UT’s 27-24 win over the Gamecocks in Neyland Stadium. South Carolina interim head coach Shawn Elliott was asked about it after the game as well. A study from 2012 found that approximately 65% of college football teams have gone to some form of synthetic turf, while that number stays closer to 50% when just looking at the Power 5 Conference teams. The Vols have utilized a lamp system over the past couple offseasons in an attempt to extend the growing season of the grass. They will continue to search for answers with two home games remaining in 2015 and an uncertain future of the field.